The wrong movie was given the Academy Award for Best Picture Sunday night. The error was discovered several minutes later, and the award quickly (and awkwardly) switched hands to the correct movie. This was not Warren Beatty’s fault. Nor was it Faye Dunaway’s fault. It wasn’t Matt Damon or Jimmy Kimmel’s fault. No, this problem began and ended with the folks at PricewaterhouseCoopers, the usually reliable accounting firm responsible for tallying Oscar votes and stuffing envelopes with names of the winners. We sincerely apologise to Moonlight, La La Land, Warren Beatty, Faye Dunaway, and Oscar viewers for the error that was made during the announcement for Best Picture. 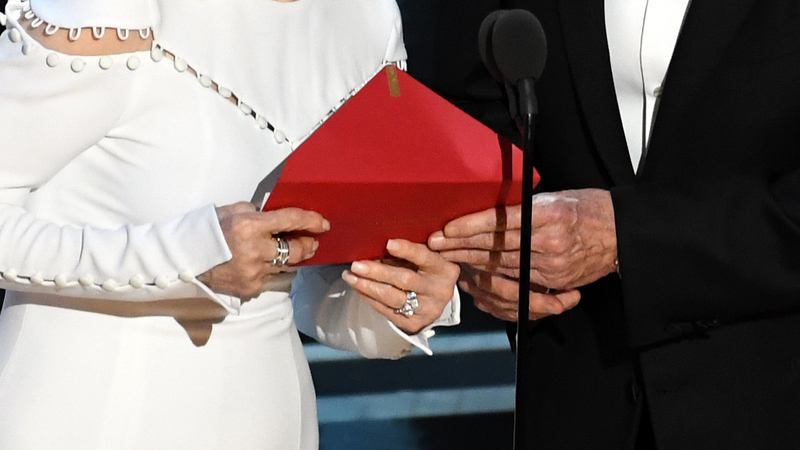 The presenters had mistakenly been given the wrong category envelope and when discovered, was immediately corrected. We are currently investigating how this could have happened, and deeply regret that this occurred. As Mr. Horowitz spoke, colleagues and others came up to him, hugging him sand saying how gracious he was. Then Adele Romanski, one of the “Moonlight” producers, came up to him, and they gave each other a huge hug. “I got to give a speech and then give you an award,” Mr. Horowitz said. What is this app, Mariah? Why didn’t you just use the Notes app? People needs to quit doing this.